Stacy Green, Psychological Suspense Author | I write about the creeps that prowl on the fringes of society. I blog about a little bit of everything! Celebrating One Year Published with Prizes! On Wednesday, November 13, this blog will automatically go to my website, stacygreen.net. All of my blog updates will be there from then on. If you want to continue to receive updates on the blog, including Thriller Thursdays and the chance to win some MONEY in December, please sign up to follow my new blog via Mailchimp. I’m going to be celebrating one year published very soon, and you don’t want to miss the party! To sign up for the new blog via email, simply fill out the contact form, and I’ll add you! I don’t talk a lot about movies on here, but today I saw Gravity with Sandra Bullock and George Clooney. This movie is unlike anything I’ve ever seen, and I’m not just talking about Bullock floating hopelessly through space, utterly alone and free falling. That in itself was astonishing, and I think this movie came as close to capturing the sheer immenseness of space and how unpredictable it can be. Very few movies literally have me on the edge of my seat, and this was one. Not to mention Bullock’s acting–her fear bled through the movie screen. So I’m giving the movie 5 stars, and I don’t care what NASA said about in accuracies. Now, onto the writing part. This movie is an excellent example of conflict and piling more and more on the character. One problem resolved, quick breather for the character, then another disaster. It’s a roller coaster that is perfectly executed. Whether you’re interested in screenwriting or not, I recommend this movie for every writer, especially suspense and thriller writers. It is the best example I’ve seen of ratcheting up the stakes while making the viewer care deeply for the main character in a long time. The movie’s setup is quick, giving us just enough interaction with Bullock and Clooney to care, and then all hell breaks loose and last until the last seconds of the movie. Beyond that, the character growth is very strong. Through fear, desperation, panic, and finally, faith, Bullock keeps fighting. We see her terror while witnessing her strength, and that is a damned hard thing to pull off. Genre tastes aside, this movie is a must see to better your writing craft. Have you seen Gravity? Do you plan to? What movies have helped shape your writing? Skeleton’s Key (Delta Crossroads #2) broke into the top 100 in Mystery Series in less than a week of release! Thank you so much to those of you who attended the launch party on Facebook and who are reading/reviewing the book. I’m thrilled with the positive response! Dani hopped in first, curling her body into as tight a ball as possible. Jaymee followed, wedging beside and half on top of Dani until they could pull the seat shut. Dani grunted under her friend’s weight, and Jaymee shushed her. Jaymee’s thick brown hair fell against Dani’s nose, and she was grateful for the sweet scent of strawberries that helped dilute the mustiness of the window seat. The sound of the antique doorknob turning seemed as loud as a canon blast. Dani gripped Jaymee’s arm as the door opened and the footsteps were less than ten feet away. Through a sliver of space in the warped wood, Dani saw the lights flicker back to life. Then, men’s boots. Large feet. Tan trousers. Thriller Thursday: Secret Passages and Tunnels on Halloween! Most of you probably know I have a thing for tunnels and passages and all things creepy and underground. Into the Dark visited the Las Vegas Tunnels, and my current release, SKELETON’S KEY (Delta Crossroads #2) features a secret passage in a historic antebellum home. So in honor of Halloween, I’m sharing my 5 Creepiest Tunnels and Passages. Sadly, I’ve not been to any of them. One day! Built in 1906, this subway runs under the Holborn Distract of London. It was built to connect existing tramways on the north and south sides of the River Thames and is the only one of its kind. It closed in 1952 but brave urban explorers still venture into the tunnels. Now here’s a place that’s on my macabe must see list. Discovered in the mid 1980s, the passage is abandoned and completely dark. The Vaults remain untouched since they were abandoned in the early nineteenth century but beware…they are empty, but not unoccupied! This eerie setting is home to dark, mysterious and often tragic apparitions whose ghostly presence leaves a lingering sense of immense sorrow and deprivation. Visitors have stumbled backwards in response to a malevolent lunge. Witnesses testify to the presence of the cobbler who labours industriously. A little boy, laughing playfully, has held visitors’ hands in his cold grasp as a brown dog with long, wiry hair runs between their legs. Described by the BBC as ‘probably the most haunted place in Britain’ The Underground Vaults never fail to fascinate and intrigue all who visit them. In Portland, Oregon, from 1850 to 1941, a series of trap doors in bars or the dead-ends of alleys were death traps for unsuspecting men. 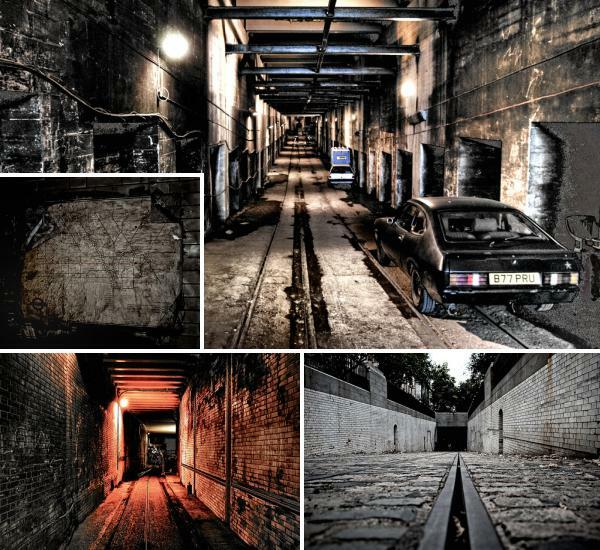 The men would fall through the unseen trap and into the Portland Underground Tunnels–the Shanghai Tunnels. Connected and extending for miles beneath the city, these tunnels served shangaiers, bootleggers, white slaves and opium den owners. The shanghaied men were forced on to ships under horrible conditions. Even worse, the white slavers stole girls as young as 14 and prostituted them, but only after leaving them in a tiny, dark cell until their wills were broken. I will see the Paris Catacombs before I die. Their history fascinates me, and I’ve no doubt ghost stories abound from the underground grave yard. 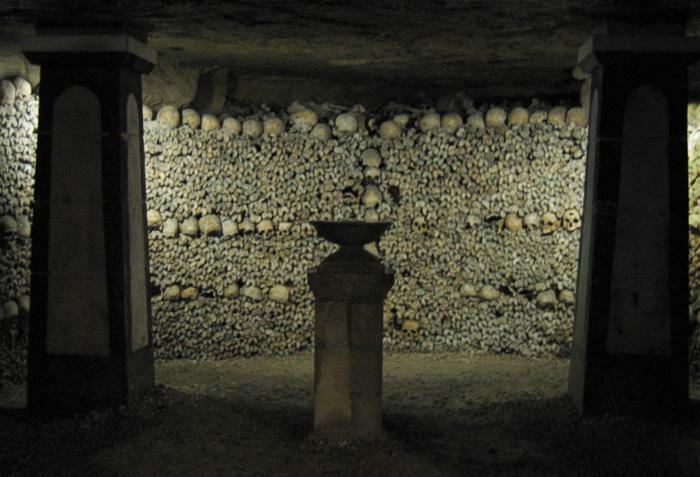 The short history of the Catacombs is this: near the end of the 1700s in France, after the plague, bodies were piling up in Paris’s various graveyards. Les Innocents was particularly bad, and the multitude of bodies was making the city’s precarious heath worse. City officials moved the bones of thousands of people into the abandoned quarries. By 1810, work began to transform the caverns into a visitable place. Louis-Étienne Héricart de Thury began renovations to transform the caverns in to a visitable internment. He directed the relocation of skulls and femurs in the arrangements seen today and used the tombstones and cemetery decorations brought over from the old graveyards to complement the walls of bones. Naturally legend and lore abound in the catacombs. Victor Hugo used his knowledge about the system in Les Miserables. The dead from the riots in the Place de Greve, the Hotel de Brienne, and Rue Meslee reside in the catacombs. Walls are decorated with graffiti dating back to the 18th century. During WW11, Parisian members of the French Resistance used the tunnel system to hide. Like I said, a must see place. Waverly Hills Sanitorium is believed to be one of the most haunted places in the world. Louisville Ghost Hunters Societyhas conducted many investigations on the premises, and their results are terrifying. They’ve heard ghostly sounds, spotted lights that couldn’t be on, had objects hurled at them, been struck by unseen hands, and have spotted apparitions. In a building where unimaginable suffering occurred for decades, it’s no wonder the paranormal activity is intense. Historians believe between 40,000 and 60,000 people died in Waverly Hills Sanitarium—some from the disease and many others from experimental procedures. So many perished at Waverly that a tunnel was dug from the lower level of the hospital out out to a field away from the main section of the hospital. Kept out of sight from the living patients, the “body chute” was a sad and busy place. Some accounts claim more than forty bodies per day were sent down the chute during the highpoint of the TB siege. A motorized wench system guided the bodies down the tunnel while hearses lined up at the end and staff wheeled the dead away. There’s no electricity in the body chute. Imagine pitch darkness with only flashlights to guide you, much like the Las Vegas Tunnels featured in Into The Dark. The chute is reported to be on of the most haunted areas of the Sanitarium. Voices have been captured on tape (EVPS), as well as unexplainable mists, cold spots, and apparitions. So what do you think? Are these places creepy enough for you? Have you explored an underground tunnels or secret passages? Don’t forget to stop by the Official Launch Party for Skeleton’s Key tomorrow on Facebook! I’ll be sharing behind the scenes secrets and giving away some very cool swag. If you haven’t had a chance to pick up your copy of SKELETON’S KEY (Delta Crossroads #2), it’s available in paperback and all digital formats. I know it’s been a while since I’ve done a Thriller Thursday post, but I wanted to talk about this amazing women. Police sketches have always fascinated me–along with any kind of visual art, really. How can an artist create accurate suspect faces from words? Especially from traumatized people? I’m sure much of it is about asking the right questions, but it’s still a skill I can’t fathom having. Meet Lois Gibson, considered the most successful sketch artist in the world. Yes, the world. And she’s got a citation from the Guinness World Record people to prove it. But Lois didn’t just decide one day to become a criminal sketch artist. 42 years ago, she was viciously raped and nearly murdered. During the attack, he choked her to the point of losing consciousness, and then allowed her to recover, only to start over again. She realized she’d her attacker would have to find release for the attack to stop, and she helped him do that. After the attack, she dedicated her life to helping others. It took the Houston police department a while to come around, as most didn’t realize the value of a good sketch artist back then. But once they did, Lois made an immediate difference. To date, she’s worked on approximately 4500 cases and helped solve 1289 of them. Gibson is said to be hyper-intuitive, able to read the victims she’s talking with, and bringing details out they didn’t even realize they knew. Baby Grace is one of Gibson’s most famous cases, and one of the more fascinating parts of her skill set. She reconstructs faces from the remains of unidentified bodies. In the Baby Grace case, Gibson reconstructed the face of a toddler whose body had been stuffed in a storage container and left to the Houston heat. Gibson’s sketch was nationally televised and led to the toddler’s grandmother identifying her. Gibson is also know for identifying the “kissing sailor” in the famous Times Square photo at the end of WWII. Through age progression, she proved Glenn McDuffie was the real kissing sailor. Her sketches speak for themselves. This compilation of her work is courtesy of 9gag. And there are hundreds more like this. Lois Gibson has put her talent to crucial use, and I applaud her. Dealing with victims, pressuring them for details they don’t want to think about, has to take its toll on a person. If you’d like to learn more about Lois, visit her website. 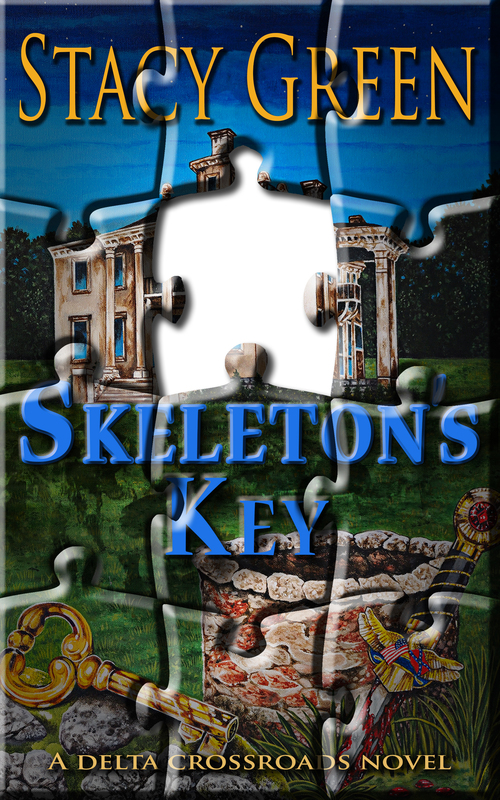 Skeleton’s Key Full Cover Reveal – Cage and Dani find the secret room! So here is the final piece of the amazing cover. I want to thank Kimberlee Ketterman Edgar for such a beautiful piece of art, and Melinda VanLone for turning it into the perfect cover. 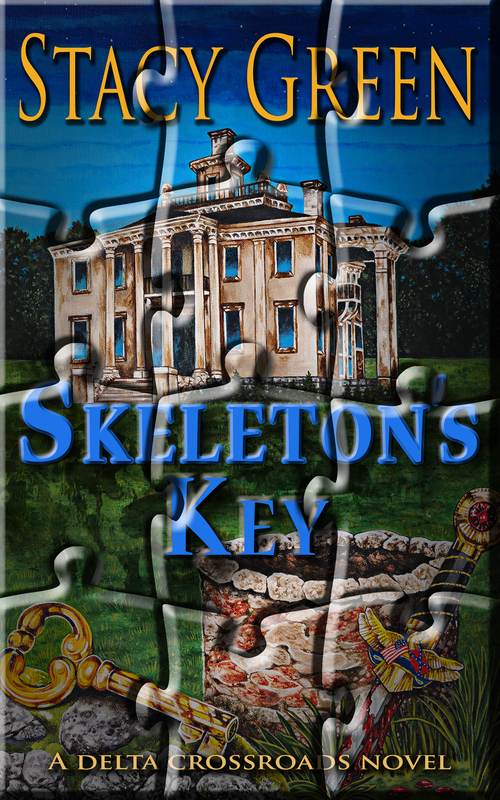 The house on the cover is Ironwood, the plantation I created for SKELETON’S KEY. The exterior is based on Malmaison Plantation, which burned down in the 1940s. And thanks to all of you who’ve tweeted and shared the cover pieces/teasers. TWO WEEKS until release! Cage couldn’t believe what he was seeing. Flashlight in her shaking hand, Dani shined the beam into the dark space. He peered over the top of her head and caught a glimpse of brass, dark wood, and an oblong table. She gave a little squeal and started to crawl inside. Her face fell, but she nodded her agreement. Cage took the flashlight. The panel was barely four feet tall. Crouching down, he stuck one leg and then the other inside the room. He shined the light on the ceiling. It was high enough for him to stand straight. “Let me in!” Dani shoved at him. One more day until the full cover is revealed! Thanks for all of your tweets and shares. This has been a really fun way to show off Kimberlee and Melinda’s amazing work. Sign up for my new release mailing list to find out about new books and behind the scenes scoop!